Lighten up on laundry. Tests show that switching from a top-load to a front-loading washer can cut your water use by half for a full load. And washing clothes in cold water versus hot can save you up to 25 cents per load. Conserve water and energy and save up to $40 per year by washing three cold-water loads a week. Program your thermostat. 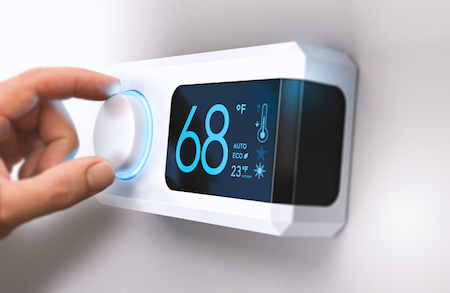 Pre-setting a programmable thermostat to start heating or cooling your home an hour or two before you get home from work (instead of letting heat or air run in an empty house all day) can save as much as $150 annually. Alternatively, lowering the heat temp by two degrees can save up to $40 per year – and setting the AC at 78 degrees instead of 73, can cut your bill by 40 percent. Upgrade your toilets. Upgrade two toilets made before 1992 to low-flow ones, and you can cut water costs by nearly $200 a year in a two-bathroom, four-person home. Replacement not in the budget? Try a Brondell Perfect Flush ($79), which converts your toilet into a dual-flush, saving about half the water and $100 per year per toilet. Use refillable containers. If you use spray bottles of window cleaner and/or other household products, buy the largest containers or concentrates and refill smaller bottles. Save money on cost per ounce and cut the number of plastic containers cluttering up the landfills. USDA Organic: Food is produced without antibiotics, genetic engineering or most synthetic fertilizers and pesticides.